Fed Up With Fungal Infections In Monsoon?....Choose Homeopathy! Fed Up With Fungal Infections In Monsoon?….Choose Homeopathy! Monsoon is the most awaited season after hot and humid summers. The first rain is loved by all of us. Rain-drenched landscapes, long drives, hot coffee, and scrumptious hot food, are some things that everybody enjoys in the monsoon in their own way. However, the rainy season is the time when we are more prone to suffer from various types of infections. In the monsoon, various fungal infections are on the prowl. And, they are more common during the rainy season than any other time of the year. This happens because the weather conditions in the monsoon season are favorable for the growth and proliferation of fungi. Athlete’s foot, ringworm or tinea corporis, and nail infections are some of the most common fungal infections that you may suffer in the rainy season. Athlete’s foot, which is also known as tinea pedis, is a fungal infection that usually begins between the toes and spreads to one or both the feet. Athlete’s foot usually causes a scaly, red rash with itching. The infection affects you if you are wearing damp socks and shoes or tight-fitting shoes most of the time. Warm, humid conditions favor the growth of the organisms or fungi leading to an increase in the infection. Keep your feet dry, particularly on your toes, and use well-ventilated shoes to prevent the onset of Athlete’s foot. Ringworm or tinea corporis begins as a flat scaly area on your skin, which may be red and itchy. This patch forms a slightly raised border that expands outwards forming a roughly circular ring. In severe cases, several rings appear close together and merge. Ringworm is difficult to prevent. The fungus that causes ringworm is common and contagious even before the symptoms appear. Nails too may get affected by discomforting fungal infections in the monsoon. 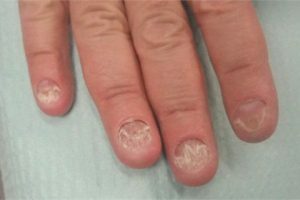 You may find your nails turning brittle, rough, and discolored due to the fungal infection. In severe cases, your nail may also get detached from the nail bed. Homeopathy is effective and strongly recommended for treating fungal infections. As the disease gets older or if you happen to use anti-fungal creams for fungal infection for a long time, then the infection tends to get more resistant to any other form of treatment. In such circumstances, homeopathy works excellently and effectively. Homeopathic medicines boost your body’s healing processes to fight and eradicate the fungal infection. Homeopathic remedies such as Graphites, Borax, Tellurium, Thuja, and Silicia, when taken under the guidance of an expert can give you a significant relief from the discomfort due to the fungal infections. Make sure you do not wear wet clothes. Keep yourself clean and dry. Never keep your skin wet for too long. Take bath with lukewarm water, and apply plain talcum powder, particularly in folds of the skin. Avoid sharing personal items, such as towel, hairbrush, and clothes, to avoid the spread of the infection. Avoid using closed and tight-fitting shoes. Avoid using damp socks and shoes. Avoid going to public pools or water parks in this season. Keep yourself healthy and enjoy the monsoon to the fullest. For more details about how homeopathy can help you in treating fungal infections, please leave your details below. Alternately you can get in touch with us via telephone (+91-22-66888888) or email (info@lifeforce.in). A very descriptive content and helpful information.